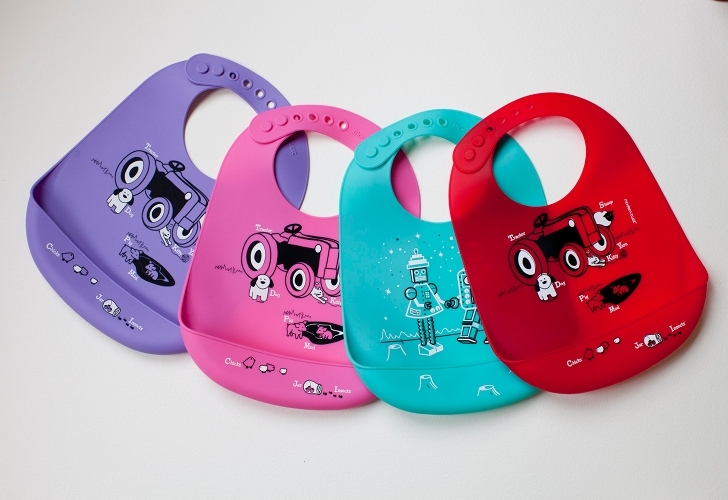 Modern-Twist, the company that brought us fantastic placemats kids can color time and again has added an eco-friendly bucket bib to their collection of baby and kid feeding gear. Their ‘Bibz’ may be easily rolled up and tucked in a diaper bag for on-the-go dining and impromptu snack sessions. The soft and flexible Bibz are made with FDA approved food-grade silicone, and they’re free of BPA, lead, latex, phthalates and other toxic chemicals you don’t want anywhere near your little darling. Bibz are hand silk-screened and feature the designs of independent artists. Available in four vibrant hues, Bibz feature two fun prints: robots and farm buddies. Modern-Twist, the company that brought us fantastic placemats kids can color time and again has added an eco-friendly bucket bib to their collection of baby and kid feeding gear. Their 'Bibz' may be easily rolled up and tucked in a diaper bag for on-the-go dining and impromptu snack sessions. The soft and flexible Bibz are made with FDA approved food-grade silicone, and they're free of BPA, lead, latex, phthalates and other toxic chemicals you don't want anywhere near your little darling. Bibz are hand silk-screened and feature the designs of independent artists. Available in four vibrant hues, Bibz feature two fun prints: robots and farm buddies.